This is an easy recipe. 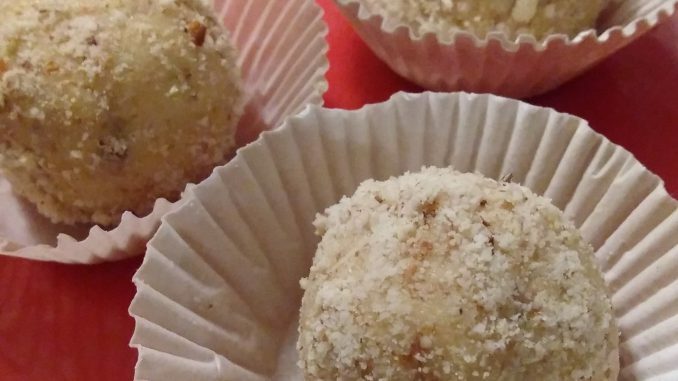 These laddus can be stored without refrigeration. 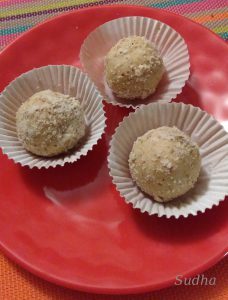 This can be a Delicious and uncommon option for Sweet Dish or for Prasad on Auspicious occasions. 2. Add powdered sugar, milk powder, salt, cardamom powder and mix. 3. Keep adding a spoonful of ghee and bind a medium consistency dough. If you add more ghee than required, you will not be able to roll laddus. 4. De-seed dates and grind in grinder into a smooth paste. 5. Add Powdered sugar (amount will depend on sweetness of Dates) and dry fruit slices and dry fruit powder. Mix it well. 6. Take a small lemon size dough ball. Using your fingers make a small bowl of dough ball, fill dates filling in it and seal the dough to make a smooth ball. Alternatively, make any other shape as you like. 7. 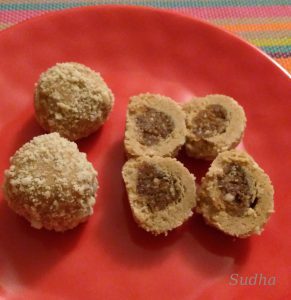 Coat laddus with dry fruit powder and serve these delicious Shahi Dry Fruit Laddus. 1. Another option for filling is using Gulkand (Sweet Preserve of Rose Petals). Add dry fruit powder to Gulkand to reduce the moisture in Gulkand. 2. If you want, you can roast the split chana dal before grinding. This will enhance the taste.